TATS A KOOL CHALLENGE: Geckos again. No new tatting to show you this week, haven't finished my doileys yet, soon I hope. 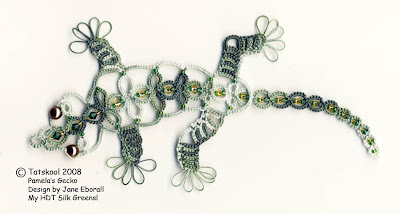 Having shown off my geckos to my college friends, while tatting doileys in my break time its good to have a selection of other things to show how versatile tatting is. 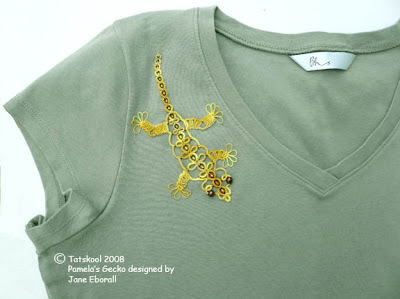 I have finally got round to tacking a gecko on to one of my t-shirts, a kahki/olive green t-shirt. 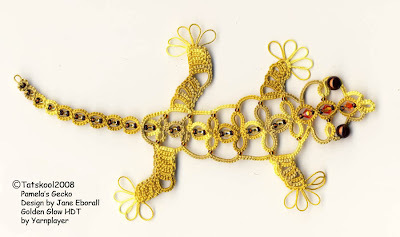 The gecko is in Yarnplayer's Golden Glow HDT. Here is the gecko on his own. The thread is size 20 and I have used 3 different sizes of gold beads, prob 11,9 and 8 plus other brown and gold beads 4mm Swarovski crystals in the head are fire opal ab, I love the effect of the bronze pearl eyes. I have made 16 geckos so far, one less now as I was persuaded to sell this little fella. He was made in my own HDT Silk Greens and has emerald swarovski's and green and gold beads. These geckos have much longer tails than the original ones as many geckos have tails as long as their body. BTW if you want to see my other gecko posts they are in the labels at the left under reptiles, tried to shorten the ever growing list of labels. I'm glad to see geckos again! Maybe I'll tat one some day! Did you make up that pattern? I like the colors and beads that you used. nah, it's Jane's pattern but she designed it for me 'cos I pestered her so much! Its a lovely pattern, you should try it. Your geckos are the absolute best! I've got to try some more with my green HDT's and get some crystals. I'm so glad you pestered Jane into designing this pattern! Hi Pamela, Your Geckos are fantastic!! I love how you put it on the shirt coming down from the shoulder. The colors you used are great!!! I especially like the use of the Swarovski crystals. Nice Touch! I have not made the Gecko yet, but have wanted to since I saw all your tatted Gecko's before. I wish I had more tatting time. Maybe over the summer I'll get more things tatted. Have a great day!!! This really is a lovely pattern! Very effective indeed! Each gecko seems to get more elaborate. I will never tire of seeing these little guys! 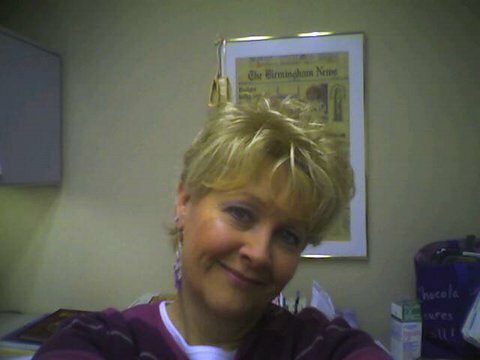 I love seeing all your geckos Pamela. The colours you used all look great on the geckos. Out of curiosity, how did you attach the one to the shirt? I still want to put one I made on a shirt. Thanks everybody, each new colour I get makes me want to make another. I only sewed it on the T-shirt quite roughly, you can even see the stitches. I found some yellow DMC 80 that was the same as the base yellow colour and used that. I didn't sew the picots down at all. the little toes curl up but that's ok. It's just going in the washing machine this morn in a net bag so we shall see how it fares.